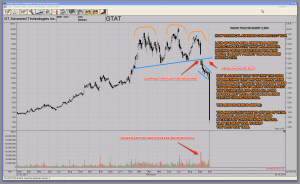 Today’s announcement of GTAT – GT Advanced Technologies going bankrupt and seeking Chapter 11 protection is a good time to review the benefits of learning Technical Analysis in order to avoid getting wiped out. These type of situations are the ones that prompted me to write ‘Fatal Trading Flaws’ a few years back. You can compound your money as long as you want, if you bet too much on a stock like GTAT and do not implement proper risk control in your trading, you will eventually get wiped out. As I’ve outlined in my chart annotations, TA is not about predicting exactly what will happen. TA is about gauging if odds are in your favor or not. It is the best tool around to help you avoid catastrophic trading losses. The GTAT chart was raising several red flags that were indicating something very bad could happen. It didn’t say it would. But simply listening to the chart and heeding the various warning signals meant you had to avoid all long exposure to a chart displaying these kind of characteristics. As I tweeted earlier: ‘Live to fight another day.’ Learn technical analysis to protect your hard earned money. Apply sound risk control and add proper money management to the mix. These three things combined will make sure you won’t get trapped. Thus, avoid catastrophic trading losses that have the potential to be career ending. Gapping through the head and shoulders neckline. No respect of support levels is often times telling. No retest / pullback towards the neckline. Indicative of severe selling pressure. Significant volume increase on down days. A sign of distribution.